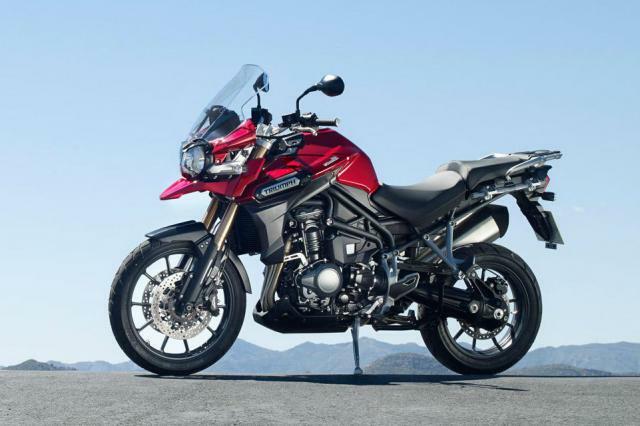 JUST as the details of the latest Tiger 800 changes were first revealed in a survey sent to owners, the tweaks to the 2016 Explorer 1200 appear to have leaked from the same source. We’ve already seen the revised bike on test in Spain, and now it appears that some of the rumoured changes – particularly the electronic semi-active suspension that’s expected to be an option – have effectively been confirmed as Triumph has started asking owners whether they’d like that sort of thing. Other new tech mentioned in the survey includes cornering ABS and an electric screen, both pieces of technology that Triumph surely needs in order to keep up with its rivals. It also includes some off-the-wall ideas like an 'integrated camera to record video while riding'. plus keyless ignition, TFT instruments and cornering headlights. Before we begin the survey, please can you confirm that you still own your Triumph Tiger Explorer? Have you ever used your Tiger Explorer in off-road? On what terrain do you do the majority of your off road riding? Expressed as a percentage, for approximately what proportion of your annual mileage do you ride off-road? On average how often do you use your Tiger Explorer? Expressed as a percentage, for approximately what proportion of your time do you carry a pillion? When you decided to purchase your Tiger Explorer, what were the most important engine parameters that influenced your purchasing decision? Please rank the following engine features from 1 to 6, where 1 represents the most important parameter and 6 the least. The Tiger Explorer features a power of 137 Hp @ 9,300 rpm. What do you think of this level of power? The Tiger Explorer features a torque of 121 Nm @ 6,400 rpm. What do you think of this torque? The Tiger Explorer features a 20L fuel tank capacity. What do you think of this volume? Which fuel tank capacity would you like to have on an updated Tiger Explorer? On an updated Tiger Explorer, how much important would be for you having the following features from 0 to 10 (0: absolutely unimportant - 10: extremely important)? What monetary value would you give to the semi-active suspension? What monetary value would you give to the hydraulic clutch? What monetary value would you give to the Cornering ABS and Traction Control? What monetary value would you give to the Cornering lights? What monetary value would you give to the Keyless Ignition System? What monetary value would you give to the electrically adjustable screen? What monetary value would you give to the full LED headlights? What monetary value would you give to the TFT instruments? What monetary value would you give to an integrated camera to record video while riding? Here below there are two images: one is the shaft drive transmission of current Tiger Explorer, the other one is a chain transmission that would allow a 15 kg weight reduction. Which one for you is more suitable for an Adventure bike? Which one would you prefer for an updated Tiger Explorer? Which kind of motorcycle do you think will be your next one? Do you have already in mind which will be your next bike?